"Very efficient," said Pirates manager Clint Hurdle of Urias. "He kept his fastball velocity up all night. His changeup is a very effective pitch, and he threw it on both sides of the plate. Impressive." This Day in Dodgers History: In 1955 Don Newcombe threw a complete game shutout against the Cubs while facing the minimum of 27 batters. He allowed just one hit, to second baseman Gene Baker, who would subsequently be caught stealing. In 1966 the Dodgers sent 1955 World Series hero Johnny Podres to the Tigers as part of an conditional deal. In 1968 the Dodgers signed free agent infielder Ken Boyer. At the age of 37 the aging All-Star would slash .271/.317/.403/.720 with 60 hits, six home runs and 41 RBI's that season. In 1996 Tommy Lasorda managed his 3,000th major league game. 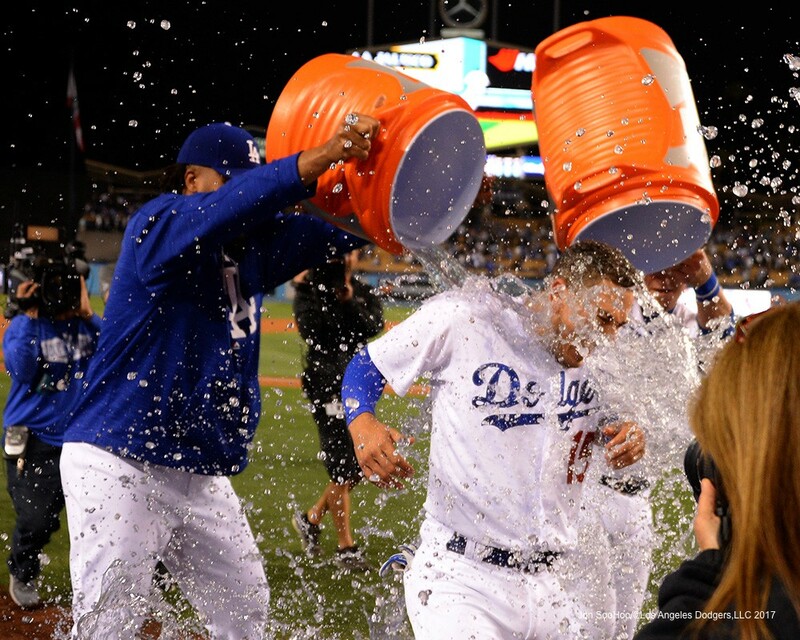 It was against the Cardinals, and the Dodgers defeated them in twelve innings, 3-2. In 2005 the Dodgers signed free agent infielder Óscar Robles. He would go on to have a good season in Blue; slashing .272/.332/.368/.700 with 99 hits, five homers and 34 RBI's. Happy Birthday, Bill Davidson, Jim Hickman & John Cummings! Via Bob Timmerman at LA Observed; "Tracking the distant signals of the Dodgers." The biggest difference between being a Dodgers fan now and one from just five years ago is intensity. When I could easily see the Dodgers on TV, I would be thinking about the team a lot. I would be very much invested in the daily ups and downs of the team. I would block out time at home to make sure to watch a game. Now, the Dodgers are something I can just check in on to see how they're doing without investing as much mental energy. Via Dave Cameron at FanGraphs; "Welcome Back Again, Alex Wood." And so, for the first time in a Dodger uniform, Alex Wood looks like the guy Atlanta had at the beginning of his career. He’s mixing a mid-90s fastball with a mid-80s curve and a high-80s change-up, and getting both whiffs and groundballs with all three pitches. Marks, 29, appeared in one game for the Rays this season (1 ER/1.1 IP) after having his contract selected by the club on May 5 from Triple-A Durham. In nine games (one start) with the Durham Bulls this year, he has gone 4-1 with a 4.60 ERA (8 ER/15.2 IP) and has held hitters to a .182 average (10-for-55). The Owensboro, KY, native has posted a 3.65 ERA (5 ER/12.1 IP) in six career big league games with Kansas City (2014) and Tampa Bay (2016-17), while going 44-66 with a 4.56 ERA in 185 games (134 starts) in nine minor league seasons in the Athletics’ (2009-10, ‘14), Royals’ (2011-14), Rangers’ (2014), Diamondbacks’ (2015) and Rays’ (2016-17) organizations. Marks was originally selected by the Athletics in the third round of the 2009 First-Year Player Draft out of the University of Louisville. Wow! Per Zach Braziller at the NY Post; "Paul Lo Duca: The time a Dodgers security guard nearly ODed on greenies." One of the team’s security guards face had turned beat-red. He had drank a full cup of the Dodgers’ loaded coffee — full of amphetamines, also known as “greenies.” Most players would take a shot of the coffee to get going. The security guard was unaware it was filled with drugs. Per Anne Wooten Green at Spark; "Dodgers Dream." She chats with one-time Dodgers farmhand Brack Bailey. Bailey, 79, has spent a lifetime swinging a bat, first at Advance High School, then with the American Legion and Pfeiffer University, and, to put the cherry on top, seven seasons as a minor leaguer for the Los Angeles Dodgers. The 10th mystery Dodger bobblehead will be of Julio Urias.